Using manual exposure is the first step to being creative with your photography. Letting your camera run amok with its settings will only give you a creative result sometimes. Watch this video to understand the exposure triangle, how to use each setting and how they relate. Keep shooting! 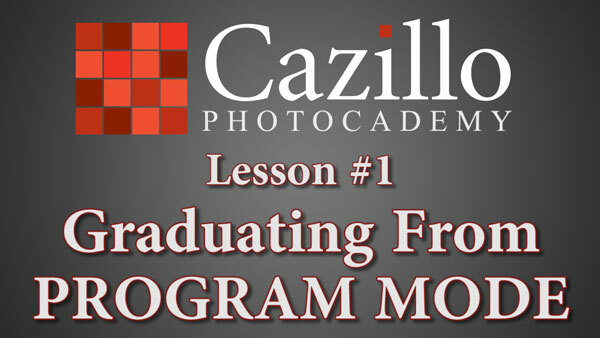 Post your assignment images here http://cazillo.com/c/forum/keep-shooting-photography-assignments/3056-photocademy-lesson-1-graduating-from-program-mode.html#6380. If you like this video please subscribe to our channel and share it with your friends. If you have any questions about any topics feel free to comment, we will do our best to answer them in a timely manner. Before we get into the exposure triangle we want to explain Stops. A stop is the unit of measure like inches or centimeters on a ruler. Stops refer to the amount of light, if you are going up 1 stop you are doubling the amount of light, if you are going down by 1 stop you are halving the amount of light. On most cameras you can adjust your exposure by 1 full stop, 1/2 stops or 1/3 stop increments. Those increments can be aperture, shutter or iso stops to get the perfect exposure for the image you want to create. For example a full stop shutter speed increment is 1/60th of a second and the next full stop is 1/125th. 1/2 stop in between those two is 1/90th of a second , 1/3 stop would be 1/80th and 1/100th second. It is important for you to memorize the major stops for your aperture, shutter and ISO, the best way to do so is to practice. Grab your camera before you sit down to watch TV at night and play with it during commercials, those 5 minute breaks add up quick! One more thing we should note, everything in photography requires some compromise in exposure, lens choice, composition etcetera. There are plenty of rules, but once you know and understand them you can easily break the rules and apply them in a creative way. The aperture in your camera lens controls the amount of light as well as the depth of field. When you are adjusting your aperture a diaphragm in the lens is opening and closing, blocking or allowing more light through the lens. The maximum aperture is allowing the greatest amount of light through the lens. This also has the effect of a shallow depth of field like in this photo. On many professional lenses the maximum aperture is f2.8. The full aperture stop is f4, then f5.6, f8, f11, f16 and f22. Some lenses will go smaller than that to f32, f45, f64 etcetera. The same goes for maximum apertures. Some 50mm lenses have 1.2 or 1.4 maximum apertures. 1.2 is actually a 1/3 stop increment higher than 1.4, then the next full stop is 2.0 and then 2.8. Now that we have the groundwork set and understand the amount of light, the second part of the aperture is depth of field. Depth of field refers to the range of distance that appears acceptably sharp in a photograph. It varies depending on camera type, aperture and focusing distance and lens type. We will talk more about depth of field in an upcoming video on lens choice in photography. At f2.8 we have a very shallow depth of field as you can see from this photo the trees in the background are blurry. That blurryness is also called bokeh. If we wanted to show a photo of 2 people we may want to adjust our aperture to f4 since one person is farther from the camera than the other. In this photo of a inflating a hot air balloon I needed to use a f8 to make sure everything was in focus. That higher number means we are letting in 1 stop less light than f5.6 but are gaining depth of field. One more example photo I used f32 on my 60mm Macro lens to be sure all of the cameras were crisp and sharp. Now that we know how aperture works, when do we use it? In my opinion aperture should be set first when using manual exposure mode on your camera. It is most important because it controls what is in focus, out of focus, and what your shutter and iso values need to be in order to create a well exposed photograph. The shutter in your camera is basically a curtain in front of your sensor that opens and closes, exposing your sensor to light. The speed at which it does this is called SHUTTER SPEED and is typically measured in a fraction of a second. So when we refer to STOPS with regard to shutter speed, we’re talking about slowing down or speeding up our shutter. Let’s say we start at 1/15th of a second. A stop down would be 1/30 and would make the shutter twice as fast, but would cut the amount of light the sensor is exposed to by half - which makes sense because you’re cutting the amount of time the shutter is open by half, right?. Keep going down full stops and we’d hit 1/60th, 1/125th (why it’s not 1/120th I have no idea, but anyhoo) we’d go from 1/125 to 1/500 and from 1/500 to what? Yep, 1/1000th. Keep in mind that cameras do allow you to go down half stops and thirds of stops, so as you spin your shutter wheel, you’ll see other numbers as well. So what does changing your shutter speed do? The speed of your shutter is used to freeze motion or allow it to blur to give the appearance of action or movement. It can also be used in conjunction with aperture and ISO to let more ambient light into a scene to properly expose it without having to send your ISO higher than you desire, but for now, we’ll talk about the freezing action component. For example. When I shoot bike racing events and want to freeze the cyclist in action, I’m shooting at a high shutter speed. This photo was taken at 1/1,250 of a second. If I want to give the appearance of motion, and show action blur, I slow my shutter speed down. This image shows a cyclist zipping by me and was taken at 1/100 of a second. Slow it down even more and you’ll get more of a blur. Keep in mind a faster moving subject will give more blur than a slower moving subject at the same shutter speed. There are also other factors to consider when setting your shutter speed besides the action in your scene. Hand holding a camera can also introduce motion and induce blur just by your normal body movements, even when you are staying as still as possible. The general rule of thumb is that for any shutter speed under 1/60, a tripod or some support should be used. Hint: If you need to lower your shutter past what’s normally acceptable and don’t have a tripod lying around, bracing your elbows on a solid surface such as a table, counter, or fence post can help. When hand-holding a camera, another rule of thumb is to use a shutter speed at least as high as the greatest focal length of the lens. For example, when using a 70-200 mm lens, it’s a good idea to use at least a 1/200 shutter speed. Proper hand holding technique is also important, at all times, but especially with a slower shutter speed. Keep your elbows in, close to the body for stability and rest the lens in your left hand, thumb out - towards the lens. The final part of the exposure triangle is ISO. ISO is the sensitivity value of the camera's sensor. The lower the number the less sensitivity, so we need more light to capture an accurate exposure. Higher numbers are more sensitive, meaning we need less light. Our major ISO stops can start at 100 for some cameras, then go to 200, 400, 800, 1600, 3200, 6400 and on some cameras up to 128,000 or higher. Using a low ISO of 200 is great for a bright sunny day like this landscape photo. A higher ISO somewhere around 1600 is required to capture photos like this one indoors where light is at a minimum. Camera engineers are really smart people. They setup our cameras to have the best quality when balancing our aperture, shutter and iso for a well exposed image. I have found many beginner photographers are afraid to use higher iso settings and end up underexposing their images instead. This will always produce a lesser quality image since you have to do more work on it in Photoshop or Lightroom. The added sensitivity doesn't come without a caveat which is noise. Noise looks like this in a photograph which can be distracting. Newer cameras are much better at controlling noise throughout the iso range. Photo editing programs have noise reduction filters but be careful using them as the image can appear too smooth and unrealistic. When setting your ISO it should be done last after aperture and shutter speed. We can set our ISO differently for every image. The goal when setting ISO is to keep it at the smallest number possible without underexposing the image. Decide how much depth of field you need and artistically what you want your final image to look like. Set your Aperture accordingly. Think about how much action is in the shot. Are things moving quickly and you want to blur them? Pick a high shutter speed. Want to blur action or people are holding still for you? You can choose a lower shutter. Use your ISO to have the appropriate light available to compose your image. You may still need to tweak the other settings depending upon how sensitive you are to the grain in your photo, but err on the side of adding grain and not underexposing or choosing too low of a shutter or aperture. The first part is to create a series of 3 images with your camera using different apertures like f5.6, f8 and f11. The images should have equal exposures, but the depth of field changes in each image. Second part of the assignment is to do the same thing but with your shutter speed. Photograph a car driving by or a child on a bicycle, something moving so you can see the difference in the amount of blur. If you would like to share the results of your assignment you can do so on our forum at the link below. Your next Photocademy lesson will be on photography histograms, what they are, how to use them, and how they can improve your photography. Keep Shooting!